Yesterday morning I was out and about on the coast of Queens looking for migrating birds. At Jacob Riis Park I stopped to scan a large flock of Brant because you never know what might end up mixed in to a large flock of anything. 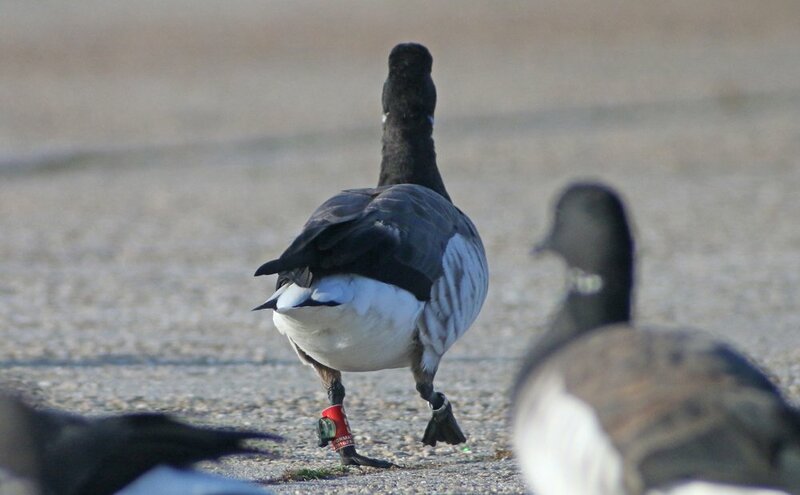 And while I didn’t find anything rare hiding amid the hordes of Branta bernicla I did manage to find one that was banded and color tagged. And, upon closer examination, it had a weird little device attached to the color band. What could that possibly be? 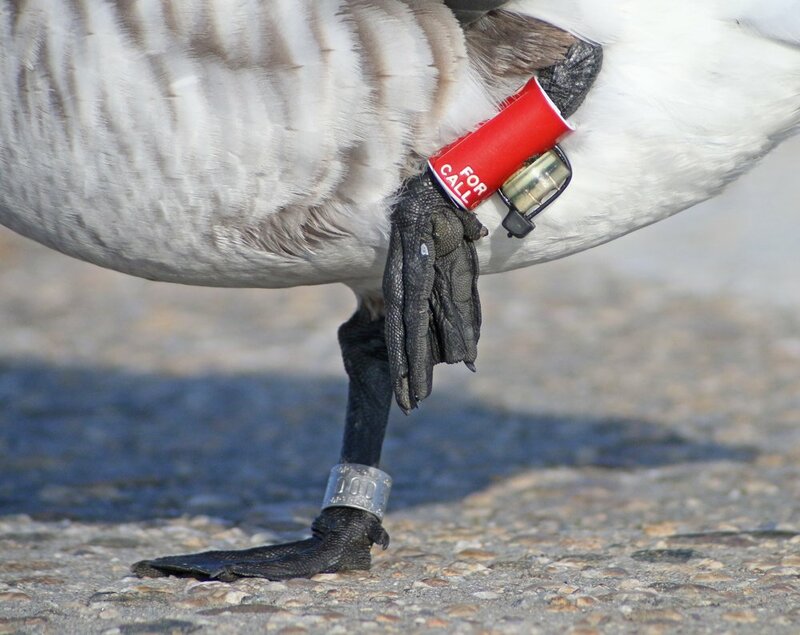 When I got home later that day I downloaded my photos and reported the band number to the feds, and then put the photos on the New York Birders Facebook page to ask if anyone knew what the weird little widget attached to the goose was. 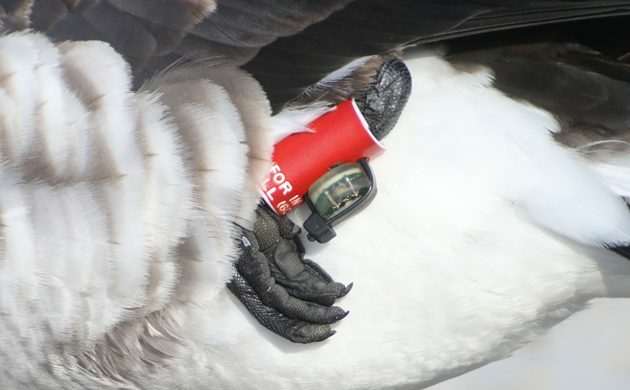 I quickly learned, thanks to the great number of educated and kind people on the Facebook page, that the bird had what looked like a light-level geolocator, a device that measures the amount of light hitting the device each day. When recovered, it can be used to figure out where the goose has been. I was also notified of a study of Brant behavior that is being done collectively by wildlife agencies from New Jersey, New York, and Canada. By reporting the banded goose I gave one more data point to to this scientific effort. Neat! And, even neater, when I woke up this morning I had already received information back about when and where the goose was banded! It was banded in Monmouth County, New Jersey, on 8 March of this year. For all I know, my report of this bird might be the first indication that the bird survived the round trip migration to and from the breeding grounds. And, considering that those doing the study are trying to figure out things like staging areas, migration stopover sites, and wintering site fidelity, my data point might help them figure things out. 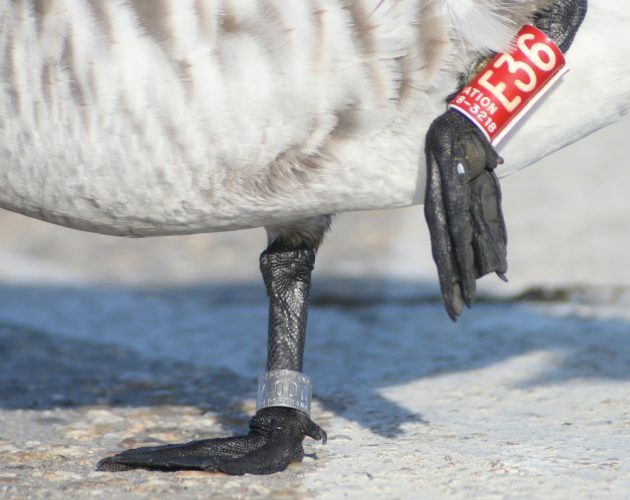 So, take the time to figure out the numbers and letters and colors on tagged birds. If possible, get the numbers off the metal bands as well. Make sure to report the bands with as much detail as you can muster. It doesn’t take a lot of effort and you can make a scientist’s day! Sure, it’s a common bird but by looking at and digiscoping it I learned about a study I didn’t know was happening, I learned what light-level geolocators look like, and I helped science! Win – win- win! That is so cool!! I had photographed a Black Oystercatcher up near the Canada border, with Federal rings, and a radio tracker. It had been captured and the tracker installed just 30 days prior to my photos. Tasmania: Take a look up!